Wishing you and your family a very happy Christmas and a prosperous New Year. We extend a BIG thank you to all our regular and new guests who have visited throughout 2018 when many PB’s were again achieved. We hope your visit has been enjoyable when it has been a pleasure meeting you all. For our 2019 season, Manor Fisheries has changed to a limited Membership only Fishery. With only 4-weeks to go before we begin accepting fishing only bookings, now is the time to apply for your 2019 Manor Fisheries Membership online at https://www.manor-fisheries.co.uk/night-fishing/. Management of the lakes through netting and electro stunning. As the new swims contain concrete the use of a rod pod is ideal. Although the use of bank sticks is still fine, when fishing near to the waters edge please avoid damage through banging into the concrete which will also scare the fish away from your swim. 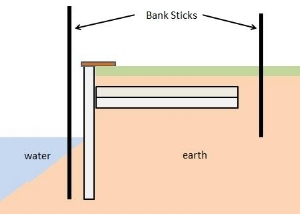 Alternatively you can locate your rods (and bank sticks) further back from the water’s edge to completely avoid the concrete. Many of our regulars will recognise that there are times during the summer when the Cats become ravenous resulting in large total session weights of Cats being recorded. 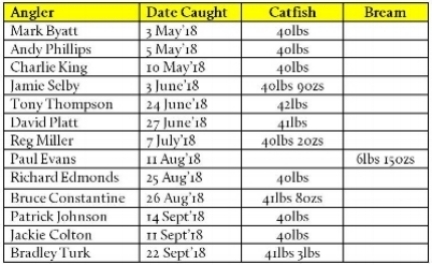 Congratulations to all the 1,000 lbs Club anglers shown below who set the bar high through landing over 1,000 lbs in a single session. It is likely that each angler will concur that they were really happy but somewhat tired at the end of their visit! Each year we award every angler with a PIN to commemorate catching their first Manor Fisheries specimen fish for each species shown below. Special mention is made of Paul Evans who wins his second species PIN having previously caught a Tench weighing 6lbs 12ozs on the 20th June 2015.